Register Log In A Gardeners Forum Forums Gardening in 2007 Can you guess it???? Can you guess what it is???? it's a mater with a 5 o'clock shadow. OH I know :p but weezie I'll whisper it in your ear! I like the answer of a mater with 5 O'clock shadow, that's funny!!! I know what it is too! ...now I feel like Meg! Well...I was under the impression it was a green tomato...but thought I was supposed to be guessing what the dots were on it. So...am I not so stupid after all? Like, was this a topic making fun of Meg and I fell for it??? We're not just torturing you, I promise..
Well, the leaves and suckers give it away - it's a tomato, I'm sure. When sorting seeds, do not whistle. After looking at it some more, the flowers are much darker than my tomatoe flowers. Some kind of squash maybe? Only other veggie I can think of with dark yellow/orange flowers. Never have seen a round one though. 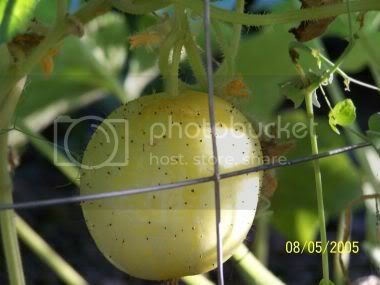 Summer squash without the long neck yet? We are all under the same stars... therefore we are never far apart.